Type: Zinc Chloride. Voltage: 1.5V. Diameter: 20.6 mm. Height: 58.7 mm. Price: £4.90 each. £4.70 each if you buy two or more. Postage and packing included. Also known as: Energizer U10, Everready U10, Eveready No. 30, Ever Ready Number 30, IEC R12, R12S. This Ever Ready U10 or R12 battery is used in a wide variety of AVO meters, vintage torches and other devices. 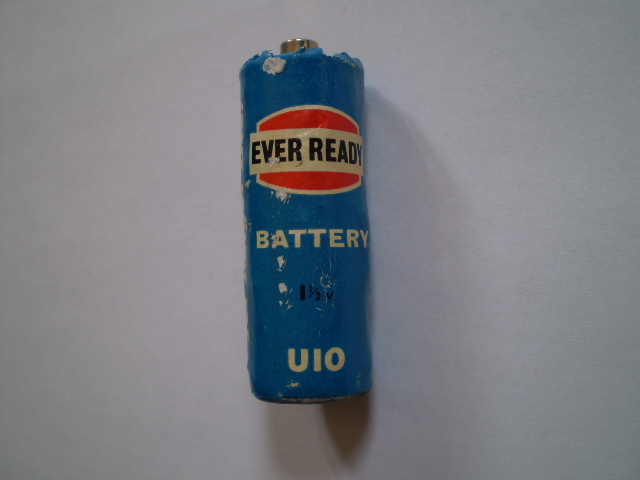 The original Eveready U10 (pictured) was a Carbon-Zinc battery 13/16 of an inch in diameter and 2 and 5/16 inches in height. In metric units that is 20.6 mm in diameter and 58.7 mm in height. Take care not to confuse it with the Burgess U10 which is a fifteen volt, 15V, battery. Our modern replacement U10 or R12 battery is of zinc chloride chemistry and out-performs carbon-zinc versions for a long battery life. These U10 or R12 batteries have a long shelf life. Why not buy two or more packs, take advantage of our reduced price and make sure you are not left without your vintage radio next time your battery runs out. * Actual manufacturer may vary depending upon availability.